Are you drinking this in? I, for one, have no words. I’ll bet that, in this recent season of thankfulness, you forgot to mention your gratitude that this outfit is not in style. I can’t even wrap my mind around it to be honest. Cast your eye over it again. Did you forget to notice the dressy gloves paired tastefully with a sweatsuit? I’ll bet you did. No one expects gloves. And honestly, I’m still stalled out back at the SWEATSUIT! 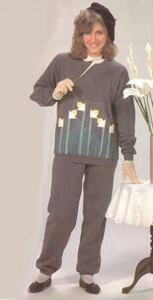 With tastefully appliqued floral motifs upon the sweatshirt, no less. Another thing you may have missed on first glance, taken aback as you so rightfully were by the sweatsuit, is that this poor girl is sporting a tam, perched precariously on the side of her perm. I think that’s why she has to hold her head that way – bobby pins are only so sturdy after all, and the whole thing may slide down onto her shoulder in a minute. Take a quick gander at the foot gear. Yes – your eyes have not mislead you – dress shoes with socks. Now that she’s decked out in this sumptuous ensemble, what does she do? She loiters coyly by a lacy tea table, holding a lily. Possibly to indicate the variety of lifelike instances in which this outfit would be appropriate. Where did I get this photo you ask? No – it’s not my senior picture . . . thank heavens. My senior picture is dated, yes, and truth be told I was wearing some serious shoulder pads of power in a black tuxedo jacket with black satin pants. But why bring up the log in my own past when I can so much more easily poke fun at this unfortunate speck? At least I wasn’t wearing dress shoes with socks. But I don’t blame this poor girl . . . this is actually the cover of a sewing pattern. Yes, she was paid to put this on, so we can give her the benefit of the doubt. But someone out there, at some point in the 1980s, thought this fashion decision was a good idea. Enough of a good idea to manufacture sewing patterns, and no doubt sell them! Fess up now . . . did any of you ever wear this in 1987? Have you ever paired gloves with a sweatshirt, tam, socks, and a perm? Did you wear it to a tea party? Or were you one of those people that wore incredibly high waisted acid washed pleated jeans with zippers in the ankles? How about hammer pants? Any of you have that dark deed lurking in your past? What about jumpsuits? I’m totally guilty on the jumpsuit I’m afraid. I had a yellow and white striped one that Mom sewed me and I loved excessively. I also borrowed her chambray one and wore it with the collar up and a silver stretchy belt. Yep. I did that. And I pegged the legs too. 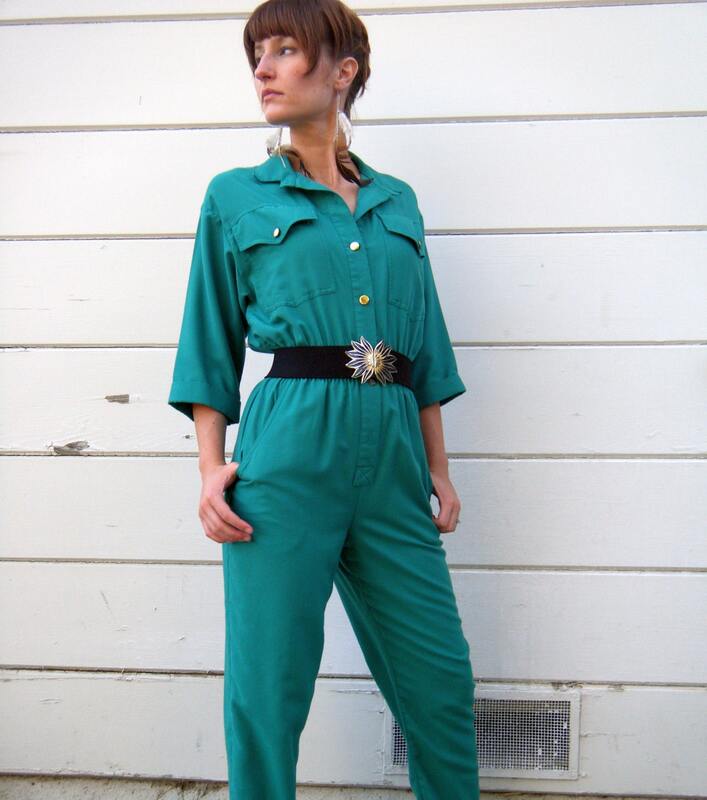 In further bad news, I’m fairly sure that I still have a soft spot in my heart for jumpsuits . . . Poverty is a great savior. When one can’t afford anything fashionable (as I could not in days of yore), one has far fewer regrets about how one dressed in years past. Not to mention hairstyles. I love my high school yearbook picture. I can’t imagine most of my classmates with their o’erwrought ’83 ‘dos still love theirs. Wow! I am thankful to have escaped that fashion disaster from the 80’s! I actually like my senior picture too except for the blue eye shadow. =) I have to say that I never wore jumpsuits either…. I like Valerie’s little verse paraphrase. I for one love this outfit. Sometimes, I want to be fancy, wear florals and dress shoes… but I also really just want some sweats. In the past, I’ve just had to wear something fancy over top of my sweats (and have then had to worry about my freshly-ironed sweats getting wrinkled), but this is a fantastic compromise! Wow! And to make it worst I thought that was princess Diana there in the picture. I couldn’t picture what a jumpsuit was…guess I didn’t own one. 🙂 This came up when I goggled it: http://www1.macys.com/shop/product/bcbgeneration-jumpsuit-sleeveless-v-neck-pleated-wide-leg?ID=621747&cm_mmc=Google_Feed_pla_pe-_-adtype-pla-_-target-19586772875-_-kw-&gclid=CImwwcyG4KwCFQoaQgodpVMaoQ Guess you can still buy one! And what a sale! I admit I had forgotten to be thankful, but now I am. Though the link Gail posted has shaken what was formerly a point of dogma in my life, that the eighties never would come back around. my grandmother had a lot of this sort of thing…but the top was always a zip-up jacket. but she was tiny and darling and ridiculously classy and it seemed less…odd. and she didn’t include the gloves. or tam. or dress shoes with socks. as to past fashion problems, mine were all easily (maybe not successfully) blamed on athletics. i was in the pool a lot, so when i wasn’t, it was wet hair, jeans, t-shirts and sweatshirts…and socks with birkenstocks. great look. unfortunately, i veer back into that ditch with very little provocation. Heheheh…. love this. I recently bought a pair of harem pants thinking their smocked waist would bring great happiness to my c-sectioned postpartum belly, and the second I put them on, my husband started calling me M.C. Hammer. I somehow missed out on that trend while I was busily matching argyle socks with a plaid skirt and, of course, a puff painted sweatshirt. The thing is, we’ll all be laughing (or cringing) in 20 years about what we wore today. There’s no point in looking back . . .
That is too funny! On the same note, but in house fashion, I was looking at a home magazine in an antique store the other day and had to laugh at the deliberate placing of ugly things. It made me think about how much time I worry over what I am going to place where in my house. Not that I shouldnt fix my house up, but dont worry over it because it will probably be ugly in about 20 years anyway! When i look at this pic, it makes me think maybe I should also be thankful I dont get to take as many pictures as i would like!!!! I still cringe at the picture of eighth-grade me wearing jeans, cowboy boots…and leg warmers. Plus a frilly shirt. And sporting a short haircut with a frizzy perm. Not to mention the shiny braces reflecting the camera flash. Was my mother horrified as she snapped that picture? Or was she smiling to herself, knowing that this would be some pretty powerful blackmail material down the road? I’d ask, but I’d rather not remind her about that photo. The darling gloves really make this outfit. I am guilty of most of the fashion faux pas of the 80s – peg leg pants, jeans up to there, acid wash, parachute pants, teased hair, high top sneakers, blue eye shadow, etc. etc. I can say, with confidence, that I never did the sweat suit thing…especially with gloves & dress shoes with socks. LOL Thanks for the hilarious trip down memory lane. My biggest 80’s regret? Giant eyewear. Oh, yes. See, I lived through high school and college in the 80’s, and I don’t recall ever seeing ANYTHING that now gets touted as “80’s fashion.” (Well, unless you count the punker girl who showed up to school in a garbage bag one day, but she was a genuine outlier.) I realize there are real, live pictures from the period, but I don’t get it. We wore straight leg jeans, turtlenecks, and crew-neck sweaters a lot. Or you could replace the jeans with a plaid skirt, solid knee socks, and flats. Oxfords and chinos were good, too. Guys wore polos, t-shirts, or oxfords with jeans. I went to a middle class high school in eastern PA — neither hicktown nor big city. But those gloves look more like latex gloves to me, but I can’t think of a context for that, so I suppose they must be fashion gloves. Beee-zarre. Oh, but Kirsten’s right about the eyewear. I had a pair of those glasses that looked like they were upside down, since the earpiece joined the rim below the center. And I couldn’t even get ones as big as I wanted, because my prescription was too strong and they hadn’t invented high index yet — or at least it wasn’t affordable for most people. Personally I’ve got some pictures from my teen years where my get-up can rival this woman’s for dorky style points any day! I am still a fashion disaster. I’m thankful for my friends who love me anyway. I’ve been amused to see the side-pony making a major comeback at the shopping mall of late. And the giant ear bangles. And leg warmers (sad, sad, sad). I had a number of mega-print sunflower (American-style) jumpers. I’ll bet you $10 that lady has a valence in her house. Gail, that jumpsuit link it too cute, that is definitely not what I was waring in the 80’s. I think that is more of a returning style from the 60s. Think more in this direction. This one is even better with the stirrups and the fanny pack. Now this was cool! I had the worst perm in the world. It’s a sort of reverse honor. Casting a jaundiced eye back to styles or music of 20 years ago is something my sons occasionally do; they call it chronological snobbery! Here’s the definition…I love it! “Chronological snobbery, a term coined by friends C. S. Lewis and Owen Barfield, is a logical argument (and usually when thus termed, considered an outright fallacy) describing the erroneous argument that the thinking, art, or science of an earlier time is inherently inferior when compared to that of the present.” Oh, yes! So very thankful! Thanks for the good laugh today, Bekah! What really cracks me up is when my daughter shows me a style she likes at a store that I know is “so ’80’s or early ’90’s”. Who knew feathers would come back in? And stirrup pants? Just saw them the other day. I’m seriously hoping that jumpers and baggy jeans never make it back in. I don’t think I want to wear anything that makes me look….um…..puffy! Laughed, no guffawed, my way my way through this post! I’m afraid I’m going to have nightmares tonight of outfits I still try to forget! I am crying with laughter. I was born in 1986 so I missed this glorious fashion era. What a hoot. Hannah, your cousin’s site is HILARIOUS. I’m sitting here giggling all by myself, and nearly in tears. 80’s fashion…. well, late 70’s…. Young Life camp… I was from Colorado… all the guys had straight leg jeans… and all the guys from…. Moscow ID( who had ever heard of Moscow IDAHO???) had bell bottoms…. never knew I’d end up living here! Many thanks, Bekah (and Hannah G!) for the amazing awfulness. I often feel, when I witness such atrocities, that the person committing them suffers from some kind fashion dyslexia. Okay, there’s a lot of people saying “think how we will feel when we look back 20 years from now.” I think I have the solution to that. with disgust and scorn. And who knows, I bet I’ll still like the same things with a slight update. #3) Go classic. Have style. But keep it simple. Perms, big bangs, and eye shadow was in then, but hair coloring is in now. If you must (and I refuse to, I actually like my hair, what a concept!) don’t go overboard. Make sure you’re at least still recognizable as you! Last, this is just not a problem for me. All my clothes are already out of style. But my style is vintage. I think people already think I’m crazy. So in 20 years when my kids are telling me how crazy I am, I’ll be used to it. It makes me (and hubby) happy now. All that matters! I don’t think everything looks awful 20 years later. Maybe people looked back on the 50s with distain in the 70s, but now I just drool over most 50s fashions. There must be some ultimate standard of what is beautiful and what is just trendy. I agree, Amanda. I was recently watching episodes of the early ’90s sitcom “Wings” and thinking that Crystal Bernard almost always looks classy in that series. I think there are usually ways to look classy and not too out-of-date. Sadly, there are also far too many ways to look ridiculous! I just found this blog last night. I LOVE it and can’t get enough. I know this post was old, but so funny! I was really laughing. I was young in the 80s too, so I missed most of this. I remember the plaid shirts and layering look of the 90s though. I always thought I wasn’t very stylish in my every day jeans, t-shirt and tennis shoes. I’m probably not, but it works for me and taking care of my little ones. I really enjoyed this and the comments are great too. Thanks!